Borrowing money can quickly become a rabbit hole into inescapable debt and stacking interest charges. Payday loans can be one of the main sources of these woes, but that’s due to shady companies and scam artists infiltrating the loan scene. These harmful companies are ruining the reputation and distracting from the benefits that payday loans offer. Knowing how to spot a safe, reputable payday loan company can protect you from financial disaster happening to you. It shouldn’t be as hard as it is to weed through the untrustworthy companies to discover the gems, but these 5 tips will help you identify red flags and know what to look for when loan shopping. Any time there isn’t a green safety lock icon before the URL, it means that the web page you’re on isn’t secure. The lock sign means that it’s a reliable website with certification and deemed trustworthy by internet authority. Websites that lack this important detail are always a major warning sign. The only time you need to worry about the lock icon is if a website requests any sort of personal information, including a password or social security number. Without a certificate, it could mean that the connection with the page is not secure and your information could be discovered. By clicking on the icon, you’ll discover a useful drop-down menu that gives you even more insight to the security of the website. Payday loan companies who don’t clearly offer a way to contact them with a number, email, or address are usually not ones that you can trust. A trustworthy company that is willing to work closely with you won’t try to make contacting them difficult, but instead encourage it. Giving customer service a quick call just to get a feel for their interest and ability to help you is another excellent way to gauge how user-friendly they are. A staff team that won’t listen to your questions and concerns won’t be a group of people willing to discuss loan terms or any potential problems with you later on down the line. Depending on if you go through a loan matching service or a direct lender, you can count on parts of your information getting shared. With loan connectors, they send your information in your application to direct lenders. Direct lenders may have your information shared for marketing purposes. A trustworthy lender will have something like this stated, and won’t claim to sell all of your information to marketers without contracts set in place. * If you’re still concerned, give customer service a ring! Scam companies and those with bad service don’t last long. It’s companies with a growing client base, a long history, and plenty of reviews that really shine when looking for a lender. Often you can find an “about us” page on a website for a lender. If they have a few years of experience in the industry and promising partnerships, you can trust them with your finances. With all the online payday loan sites, sales-inclined review sites, and boasting promises by fake reviews, it can seem impossible to pinpoint exact facts about a company. As reliable as these 5 tips are, it can be discouraging when you realize all the work that goes into simply finding a payday loan that you trust. An easy alternative is to take our word for it and check out what we consider to be the top two safest payday loan websites available. Learn more about our favorites! From start to finish, CashNetUSA is exactly what you should look for in an online payday loan direct lender. Their website is secure, their information easy to find, and everything laid out very professionally. With over 10 years of history with their company and over 5 million satisfied customers and heavily positive reviews, it’s clear when you visit them that this is a business with their head on straight. Currently, you can only get a CashNetUSA loan in certain states, so if they don’t service where you live, use their standard as a guideline on what to look for. Different from a direct lender, LendYou does the hard work to find you a loan for you. It’s a connection service, which essentially means that it uses your information and sends it to affiliated companies they have approved. Once these direct lenders get your application from LendYou, they use the service to match with loans you qualify for the most. These sites are great because they’re quick and easy, but you have to be careful. Sometimes the affiliated lenders aren’t safe and secure. LendYou works with trusted direct lenders so you can be assured that who you’re matched with is safe and won’t land you in trouble. However, the one downside to using a loan connection service is the sharing of your personal information. 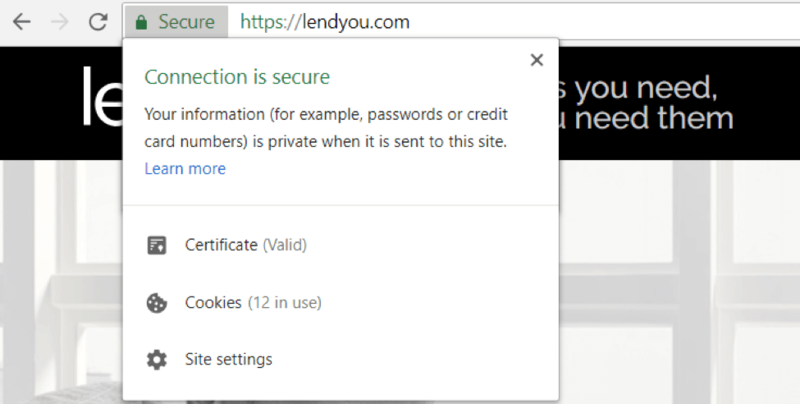 Any time you go through a website like LendYou, they will send your application to other businesses who may have different privacy policies concerning what can be shared.